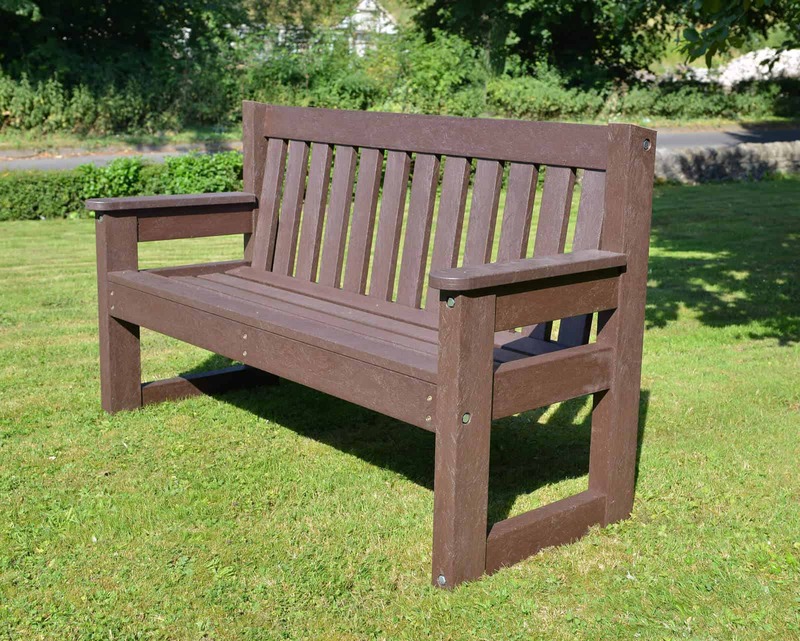 The recycled plastic outdoor Dale bench a classic design to rival any timber bench. 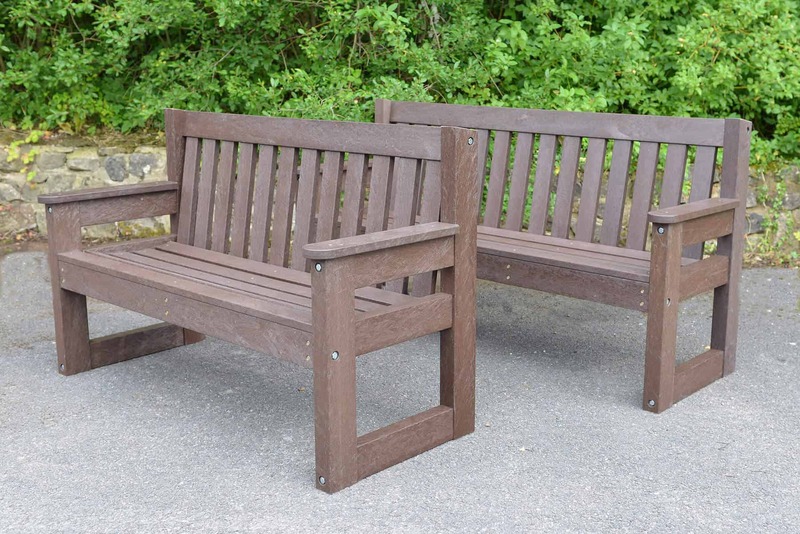 Our recycled plastic outdoor Dale Bench is a classic seat design to rival any timber bench. This is one of our latest designs. With the recycled plastic outdoor Dale bench we have refined the traditional design of this very popular bench. With a slightly curved seat it is extremely comfortable and a great focal point in any environment. The longer 1.8m version is favored by sports clubs such as bowls, tennis and cricket were spectators can while away time in comfort. Whilst the 1.2m version is ideal for domestic gardens. The Dale is very easy to maintain are very long lasting. Just a wipe down every year or so will keep your Dale bench in top condition. You can order the Dale in brown for a traditional look or black for a stylish and more modern feel. Outdoor seating has never been so easy. 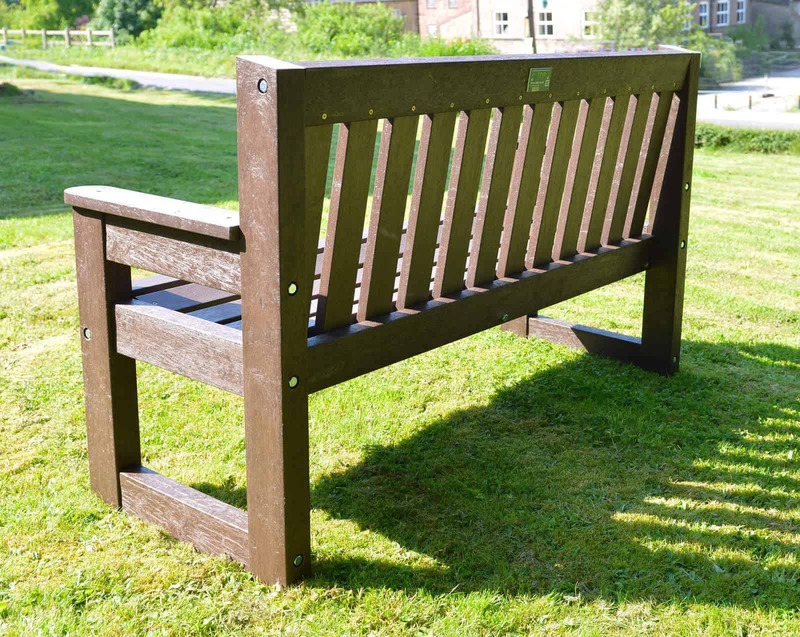 The Dale bench also makes an ideal Commemorative bench by adding one of our brass plaques. Can also be used as a seat with our dining and occasional table sets. Made from recycled plastic waste that would otherwise been destined for UK landfill the Dale is a sound environmental choice. The Dale bench will not blow over in high winds or wash away in floods. If security is an issue you can use either a TDP hard or soft ground anchor kit. I would like to extend our thanks on behalf of the families who have purchased the two recently delivered benches.We are pleased that they are both now in position on St Peter’s Park , and represent a lovely tribute to whose memory they were purchased.I would like to extend our thanks to your team who delivered them not only on time, but carried them to the Pavilion and put them into our store, this was a great help. Finally, I would not hesitate in recommending your company in the future , your customer service was friendly and very accommodating. I purchased the Dale garden bench from TDP and am exceptionally pleased with the product, the help and advice given to me by the sales team and delivery. The bench was a Birthday gift for my Father who is highly delighted with it and would recommend it for its quality and comfort. Many thanks TDP. Many thanks to you and your team for the quick delivery of the 2 seats that we ordered from you. I know you had problems with the van but still managed to deliver on the said date and the 2 lads who came to lift the seats into position were very efficient, polite and are a credit to your company. We at the bowls club are delighted that we have now totally replaced the seating around the green and over the past months we have had many comments on how well the seats look and feel to sit upon. I would like to take this opportunity to thank you for the help we have received in guiding us through the process of ordering our benches for Cefneithin Park, we are most grateful. It is very pleasing to deal with a company where the traditional values of providing a quality product, value for money and customer service are still held. It has been a pleasure doing business with you and we hope to do so again in the future. Thanks so much for the beautiful bench. It was just perfect. Mum is so thrilled with it and had such a happy 80th. I am very grateful for your advice and so glad we found you.